Does a Conceptual Data Model contain Attributes? I think the answer is yes, of course. A Conceptual Data Diagram can be defined as a coherent set of related conceptual entities. Entities have attributes, even conceptual entities. Why is this question of importance? Well, many people who try to model and to capture the business and IT of an organization, are stuck with how detailed they should go about creating a data model of the organization. But if a conceptual data model contains attributes, people will capture them, for example, during a workshop. And if a conceptual data model, by definition, does not contain attributes, they won’t or shouldn't capture them. It makes sense to have good discussions about the key attributes for the important concepts of the business and IT in the model. Now with the age of Data arriving and data scientists popping up in every organization, conceptual data models are becoming very popular. The better you understand the data concepts in the organization, the better you can analyze and get something sensible out of your Data Lake and fire off some value-added artificial intelligence. What is a Conceptual Entity? An entity can be defined as something that can be identified apart from its environment or surroundings. An entity can be modeled as a set of attributes/properties, operations and functions. An entity is often tied to a real-world concept like “customer” or “company”. Entities are often used to create a mapping between a real-world object and a database table. Entities hold information about a system and every business domain of any company contains many entities. A conceptual entity can be defined as an entity abstracted from implementation aspects. An example of a conceptual entity would be: car. “Car” as a conceptual entity can have attributes. Even the archetype of a car. Because then we actually recognize it or know it a car. A car has wheels and a car has a color, a car has a carbon footprint and a car has an owner. Even at a conceptual level, it might be interesting to work with the color or carbon footprint as attributes for car. Maybe it is most important to remark that any entity should be included in the conceptual model if it has meaning for the people of the business. If it does not have meaning for the business. the CDM will fail to realize its function. If the business stakeholders of an organization, like managers and staff, want to understand how their business works and want to support IT and Data, and want to support people to build the best ever IT support for their business, more and more often a conceptual data model is created. A conceptual data model captures the essential concepts that are present or should be present in the organization. One can create an AS-IS CDM and TO-BE CDM. Suppose an insurance company wants to start a digital transformation, a good understanding of the concepts of Customer Centric, Self Service and Insurance Product Formulas are important. A conceptual data model normally describes a complete enterprise or business with only 30 to 50 concepts (or conceptual entities). Every concept is defined and every concept is related to one or more other concepts. Next to people in workshops, creating conceptual data models, there are also institutes and professors busy with conceptual data models, but more on the definition side of it. 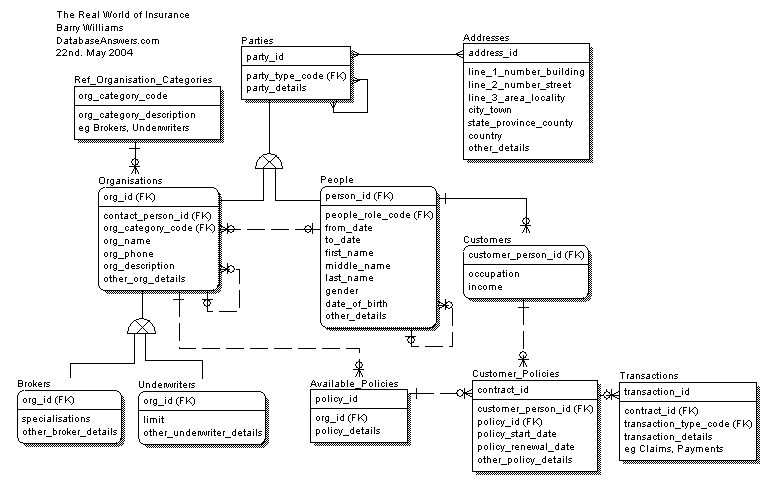 According to ANSI (ANSI/X3/SPARC Study Group on Data Base Management Systems, back in 1975; Interim Report) a Conceptual Data model can be defined as follows: A conceptual data model describes the semantics of a domain, being the scope of the model. As an example, it may be a model of the interest area of an organization or industry. This model would consist of entity classes, representing kinds of things of significance in the domain, and relationship assertions about associations between pairs of entity classes. A conceptual schema specifies the kinds of facts or propositions that can be expressed using the model. In that sense, it defines the allowed expressions in an artificial 'language' with a scope that is limited by the scope of the model. Next to a conceptual model example, the ISO TR9007 defines a conceptual schema. These two are closely related. For some, they are even the same. A conceptual schema, like a conceptual model, is a map of concepts and their relationships. A conceptual schema typically contains main concepts and main relationships. Definitions are very important. If you have the wrong definitions for terms you use, misunderstandings, disinvestments and failures are just around the corner. Words like “business capability”, “application function” and “business service” are often used, but many different meanings are attached to them. If one would create a list of occurrences of these three entity classes, anyone would create a unique list. So when we are talking about a conceptual data model, it is also very important to define what is a conceptual data model. And if someone ask: does a conceptual data model have attributes? Then that question is also very important, to make sure we do not waste valuable time, money and resources doing the wrong things. Are all the words used in a definition predefined? Does the definition of quality and quantity? In other words, does it make clear what the scope and border are of the term? Are there any counter examples? Can you provide an example that does not fit the definition? These three criteria do not guarantee to create the one and only correct definition for a term, but it helps to improve any definition for a term. A conceptual data model is a coherent set of related conceptual entities with attributes. Although this picture is somewhat vintage, it is still a great picture. It shows a graphical representation of a conceptual data model. This model recognizes the concepts of organization, party, address, person, customer, broker, underwriter, policy, contract and transaction. These are all essential business concepts for an insurance company. The conceptual data model relates these concepts. For IT and data people they can now communicate with the business on this and build modern IT support for the business or perform a digital transformation that is necessary to make sure the insurance company will survive the age of data. For many people, this diagram may contain too many technical details as in the modeling language notation is used. But the essence of the diagram will be very clear to anyone who works in the business of insurance. A today's version of such a conceptual data model would contain conceptual entities like Insurance Fraud, Customer Interest, Identity, Claim Behavior. With such a modern diagram version of a conceptual data model, any insurance organization can focus on what the most important data is for the business and for what data to make an effort for data visualization or artificial intelligence. Because of the new age of Data, data modeling is back, more than ever before. And what we now need are experts in data modeling, sound definitions and good tools. And discuss attributes of conceptual entities in workshops.